During my studies in the States I had the chance to meet people from all over the world. My best friend was from Nigeria and I made friends from Colombia, Sweden, Spain, Singapore, Indonesia, Sudan and several other countries. I had a Swiss teacher called Mr. Bachli and he was such a fun person to be with. Apart from Mr. Bachli and Heidi, of course, I had the chance to get to know Sissi. Sissi is Swiss and she has a beautiful blog called With a Glass. You can find Swiss and international dishes in her blog. It is the first time I make a recipe of hers, but I can assure you it won’t be the last. Do visit her blog and check out her awesome recipes and photos. When I saw these cookies I couldn’t resist for two reasons. First, they only needed 3 very common ingredients and second they were so easy and fast to make! Well, I lied I have another one serious reason; my husband! He is a huge fan of coconut. He simply loves the stuff. So, that was it then, I decided to go ahead and make them. My friends you cannot believe how easy and tasty these cookies are. Total time of preparation and baking is 25 minutes. Amazing ha? Easy, cheap and delicious what more can I ask? I guess nothing else. Thanks Sissi for this easy and delicious recipe. For me who have to deal with the lack of time every single day, this is an oasis. By the way, I made two batches at the same day as the one just vanished in 5 minutes. In a bowl throw the egg whites. Throw the first 4 tbsp of sugar and coconut and mix with a spoon. Then throw the rest of the sugar and another 4 tbsp of coconut and mix again. Throw another 4 tbsp of coconut and mix. At this moment a sticky, moist dough must have formed. If you can work with it then do not throw the other tbsp. of the coconut. If you see that it still needs another one then go ahead and put it in. With gloves or wet hands form small balls, as small as an apricot, and place them on a parchment paper on a baking tray. In some of them, I made a little hole with my finger and filled it with chocolate chips. You cannot blame a girl for her love for chocolate. Bake for about 20 minutes, mine took couple of minutes less, and remove from the oven as soon as they have acquired a light golden color. Προθερμαίνετε το φούρνο στους 175 ° C.
Σε ένα μπολ ρίξτε τα ασπράδια αυγών. Ρίξτε τις πρώτες 4 κ.σ. ζάχαρη και νιφάδες καρύδας και αναμείξτε με ένα κουτάλι. Στη συνέχεια ρίξτε το υπόλοιπο της ζάχαρης και άλλες 4 κ.σ. της καρύδας και αναμείξτε ξανά. Ρίξτε και άλλες 4 κ.σ. καρύδας και αναμείξτε. Αυτή τη στιγμή πρέπει να έχει σχηματιστεί μια κολλώδης, υγρή ζύμη. Εάν μπορείτε να εργαστείτε με αυτή μην βάλετε την τελευταία κ.σ. καρύδας. Αν δείτε ότι εξακολουθεί να τη χρειάζεται προσθέστε τη και ανακατέψτε ξανά. Με υγρά χέρια ή με γάντια φτιάξτε μικρές μπάλες, όσο ένα βερύκοκο, και βάλτε τις σε ένα ταψί στρωμένο με χαρτί ψησίματος. Σε μερικά από αυτά έκανα μια μικρή λακούβα στο κέντρο και τη γέμισα με μπαλίτσες σοκολάτας. Δεν μπορούσα να αντισταθώ στον πειρασμό! Ψήστε για περίπου 20 λεπτά, τα δικά μου μου πήραν δυο λεπτά λιγότερο, και βγάλτε τα από το φούρνο μόλις αποκτήσουν ένα απαλό χρυσό χρώμα. in regards to the habits of an person instead of the need to take any supplements. intestines a way to cure the injury Gluten previously caused. by exercising and proper diet. evey one is sharing information, that’s actually fine, keep up writing. to mejtion that I’ve really enjoyed surfing around your weblig posts. diamonds do exist within debris? Interested in more gaming lists? hello!,I love your writing so so much! proportion we keep in touch extra approximately your article on AOL? right here, certainly like what you are stating and the way through which you assert it. to make your site mobile friendly? My blog looks weird when viewing from my apple iphone. What i don’t realize is actually how you are not really a lot more well-favored than you might be now. You should create some high Pagerank contextual backlinks in order to rank your page. These look great and they are very simple. Thank you for sharing them on our Community Link Event at Our Little Family Adventure. Please join us each Friday for the event. Who can say no to those. Yummy! those are great, katerina! 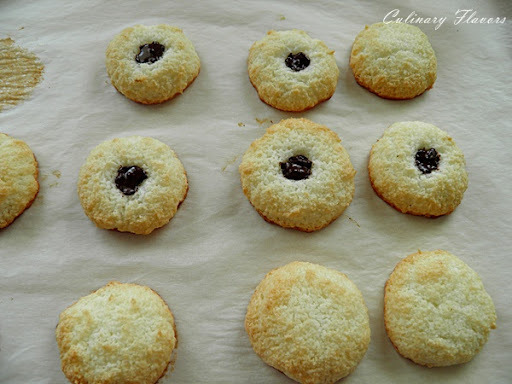 coconut is one of my favorite ingredients, and i’d happily devour cookies with or without the plop of jam in the middle. The golden coloring on these is so beautiful. My husband also is a big fan of coconut and I know he would love these. How lucky to have met such wonderful people from all over the world. My daughter spent several years as an ESL teacher in Chile, Peru and Japan. She still has friends from those experiences. I adore coconut, so these are on my treat list. Have a good weekend! Coconut always sounds good to me! These cookies must have such a great texture! 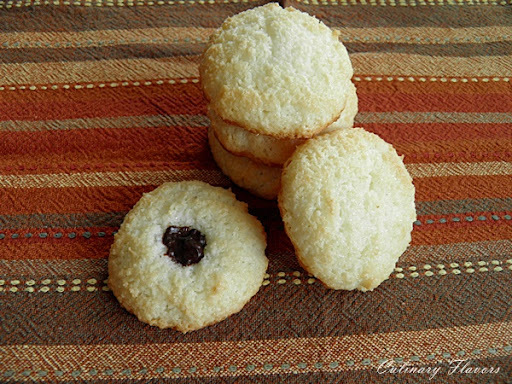 Quand ils sont moelleux à l’intérieur, ces cookies sont divins. Les tiens sont très réussis et ceux avec cette petite pointe au chocolat doivent être délicieux. they look perfect, and love they are so easy. Simply amazing this cookies makes with just 3 ingredients! Nothing better than a coconut macaroon, Katerina. Love the chocolate chip in the center. I am a lover of coconut too! These are tasty little treats! I love your special touch with the chocolate. Perfect. Those are gorgeous, and I love how simple they are. At first I thought the chocolate was jam, and now I’m wondering how they would be with a tiny bit of cherry jam in the middle. Καλησπέρα! Η καρύδα είναι αγαπημένο υλικό και τα συγκεκριμένα μπισκοτάκια πολύ νόστιμα! Ακόμα και για μας που κάνουμε δίαιτα! These cookies look very easy to bake with just 3 simple ingredients. This recipe is brilliant! 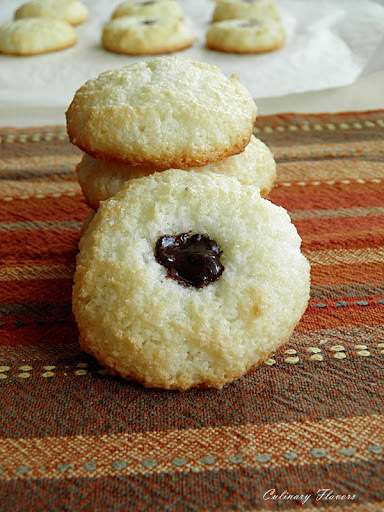 I love coconut macaroons…chewy, soft and just amazing! It’s hard to believe any cookie can be that simple. I am really impressed. THey do look delicious and so pretty! Best part is the easy steps! Love your photos! I love coconut! These are adorable little cookies and the dab of chocolate on them is a perfect touch. Πραγματικά πολύ λίγα υλικά και γίνονται υπέροχα κουλουράκια. Πολύ εύκολα και γίνονται γρήγορα. Πολύ δελεαστικά αυτά τα μπισκοτάκια Κατερίνα και κυρίως πανεύκολα, αλλά κι η σοκολάτα από πάνω δίνει την χαριστική βολή!! 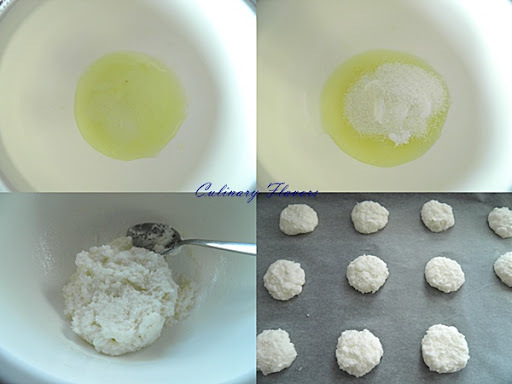 I remember this from Sissi’s blog….so easy to make. I like the idea of adding the chocolate chips as I love coconut and chocolate. Κατερίνα μου καταπληκτικά.Εύκολα, γρήγορα και πολύ νόστιμα!θα τα δοκιμάσω!!!! Πόσο υπέροχα φαίνονται Κατερίνα μου……να κάνουμε ανταλλαγές λέω μεταξύ μας τα μπλογκς!!!! What great cookies, I love macaroons and that dollop of chocolate gilds the lilly. How beautiful! These coconut cookies look great Katerina, only 3 ingredients…I am glad that you got to share this recipe…somehow I missed from Sissi’s. It’s funny, when I studied in Europe I likewise got to meet people from all over! What lovely cookies! And a Swiss cooking blog – sounds intriguing. Και η καρύδα μου αρέσει τόσο πολύ! I love the little chocolate dots in the cookies! Dear Katerina, what an extraordinary surprise! Your cookies look gorgeous! Exactly as I love them: crunchy outside and chewy inside! And the chocolate chips idea is simply a work of genius. 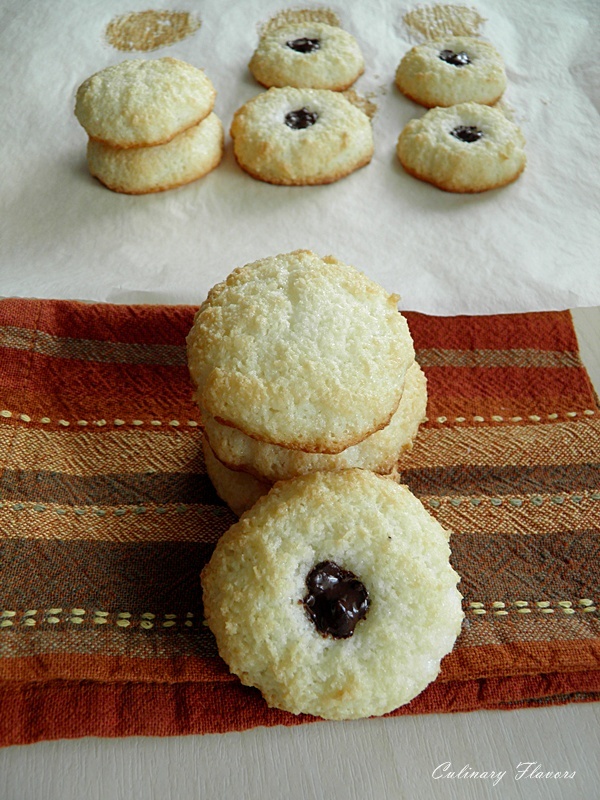 I am honoured, flattered and so proud to see my humble cookies on your blog! Thank you for so many kind words and compliments which all make me blush I am happy you and your husband liked these coconut sweet treats. It’s such a pleasure to share one’s favourite recipes with blogging friends. Thank you again for the link and all the wonderful words you have written about my blog. Είναι υπέροχα και πολύ όμορφες οι φωτογραφίες! I can’t believe these cookies only have three ingredients! They are lovely. My husband loves coconut too so I will have to make these for him. A classic macaroons, my dad who is Austrian loves these. So fun to have friends from all over the world.